¶ 1 Leave a comment on paragraph 1 6 In Spring 2013 I had my students write for Wikipedia. This is by no means an original idea, but the specific assignment was somewhat novel: in a senior class on 21st Century Native American Literature, each student was to write a biography of a living Native American author (one not yet represented on the site), crafting an entry that met both the author’s and Wikipedia’s standards. 1 It’s been a long time since I have had students so eager to get things right, and so proud of the results. Though we definitely flushed out some problems–namely Wikipedia’s “notability” requirements, discussed below–the assignment was a success. Students gained new skills, and a better grasp of the professional writing process. The Native authors were gratified to be represented on Wikipedia, and often eager to help with sources. And I got to enjoy the pedagogical role of facilitator, rather than gatekeeper, while helping to improve Wikipedia’s representation of indigenous literature. ¶ 5 Leave a comment on paragraph 5 3 Wikipedia encourages School and University Projects, offering online tutorials and other support for teachers and students; hundreds of courses, all over the world, have signed up. 6 Several such experiments have been described in the volume Writing History in the Digital Age. Amanda Seligman uses Wikipedia in a historical methods course at the University of Wisconsin-Milwaukee, to teach undergraduates about tertiary sources; Shawn Graham had freshmen in a Digital History seminar at Carleton University “blitz”-edit a single entry, on the Ottawa Valley. 7 In these case studies, historians use Wikipedia to reflect on their profession’s standards, comparing these to the practices of popular and crowdsourced history, particularly when it comes to the notion of neutrality. ¶ 6 Leave a comment on paragraph 6 2 But, in that volume, only Martha Saxton, who teaches Women’s History at Amherst College, tackles the more global problem: “to the extent that popular judgment determines what history gets produced in this format, the significance of women’s role in it and gender as a discourse or a method of analysis are likely to be devalued.” 8 I, too, was concerned about Wikipedia’s failures in coverage—specifically, its lack of representation of Native American authors, and even more specifically, its lack of representation of Native American authors based in New England, though that last failure is not unique to Wikipedia. 9 Before Spring 2013, the site included only three Native authors from this region: eighteenth-century Mohegan minister Samson Occom, nineteenth-century Pequot minister William Apess, and contemporary Abenaki poet Joseph Bruchac). 10 This trifecta, repeated in many anthologies and a good deal of literary scholarship, perpetuates the misconception that Native people in New England assimilated early on, and exist only as isolated individuals today. ¶ 9 Leave a comment on paragraph 9 3 Professorial maligning of Wikipedia aside, I do not know too many who truly require their students to abide by standards as rigorous as those of Wikipedia, whatever we might wish or claim. This was an enormous surprise for me as well as my students, and I have colleagues who still refuse to believe it. But the students found there was simply no way to grade-grub or plea-bargain their way out of the site’s very basic writing standards. If they committed mechanical errors, an anonymous editor would correct those. If they committed too many, an editor could take their article down altogether, or at least flag it (“This article could benefit from an improvement in writing style”). If their research was thin, they’d be mortified to find some 17-year-old in Turkey declaring their article a “stub,” or someone with a silly handle nominating their work for deletion altogether. In the end, one of this assignment’s greatest boons was that students came to see me the way I’d always seen myself—as the facilitator, not the bad guy. They were in closer and more frequent contact with me about their drafts than any students I can remember, seeming unusually accountable and motivated. ¶ 11 Leave a comment on paragraph 11 8 I gave students a clear sequence of steps, spread out over 3-4 weeks: 1. Sign up for a Wikipedia account, and take the tutorials. 19 2. Begin drafting your article in your sandbox, and send me the link. 20 3. After I approve your draft, send the link to the Native author who is your subject for feedback. (Each author was someone with whom I was personally acquainted, and had contacted in advance, asking if they’d be willing to participate in this project, and I brokered the introductions of students to their assigned authors.) 4. “Create” the article. 21 I was fortunate to teach in a digital lab, so we devoted several class periods to reviewing what makes an article “stick” in Wikipedia, as well as to writing and editing. Many students, at least at my public university, still lack basic web literacy—signing up for accounts, following tutorials—and most were grievously intimidated by the prospect of using markup (which Wikipedia has since made optional). The assignment was thus an empowering one for our English majors, showing them that they can master more “tech” skills than they realized. Moreover, writing for Wikipedia is a powerful lesson in professional writing process. Some graduating seniors, who had grown rather accustomed to writing their essays the night before their deadlines, and squeaking through with Bs or Cs, found that this was simply impossible in this platform. Thus, some found their articles proposed for deletion, and did poorly on the assignment, because they skipped some of the interim, low-stakes (yet critically important) parts of the assignment designed to keep them researching, writing and revising. ¶ 14 Leave a comment on paragraph 14 0 Click to view full version of excerpt from “Talk” page on John Christian Hopkins entry in Wikipedia, 2013. ¶ 16 Leave a comment on paragraph 16 0 Click to view full version of excerpt from “Talk” page on John Christian Hopkins entry in Wikipedia, 2013. ¶ 17 Leave a comment on paragraph 17 3 Participating in such forums, students engaged in real conversations about real matters affecting Native people, while getting practical experience in convincing readers that their topic matters–not least by improving their research and writing. The Hopkins debate was finally closed for lack of consensus, and (at least as of this writing) the article remains live. ¶ 19 Leave a comment on paragraph 19 0 Click to view full version of excerpt from “Talk” page on Trace DeMeyer entry in Wikipedia, 2013. ¶ 20 Leave a comment on paragraph 20 0 Wikipedians are justifiably concerned about individuals (and other entities, from garage bands to corporations) attempting to use the site for promotional purposes. But these editorial debates over Native American public figures allow students to see that this concern can also have racial and political overtones. In the DeMeyer case, at least, some editors appear to be sensitive to the proposition that “notability” itself is not an apolitical concept (unlike “duffbeerforme,” who seemed unwilling to entertain the idea that the Native American Journalists Association was not just some fringe entity). And here was another powerful lesson for students: editors are often not objective, or informed, or even that smart. They carry their own agendas, no matter how “neutral” they may claim or try to be. ¶ 21 Leave a comment on paragraph 21 0 DeMeyer was one of a handful of Native authors whom I was able to bring into my class (others emailed, or Skyped with the students). By the time she visited, students had some insight into the forces that keep indigenous literature and indigenous issues invisible. They were impressed, and surprised, by her career, her productivity, her connections and her knowledge. Their surprise is only partly attributable, I think, to their youth, or to their location at a public university in New Hampshire. Settler colonial society, of which the United States is undeniably one, has to do a great deal of work to keep indigenous presence invisible. Spring 2013 was the heyday of #IdleNoMore and the Violence Against Women Act, indigenous issues that received only modest coverage in “notable” sources like The New York Times. 26 When I required students to follow these issues on Twitter, they found huge numbers of Native American people (indeed, images of huge Native American crowds), using social media, fighting for sovereignty, speaking their languages, protecting their traditional homelands, and writing. But to find those, of course, they had to bother to look. ¶ 22 Leave a comment on paragraph 22 3 Wikipedia’s “notability” standard mimics the centrifugal force exercised by literary canons, even within such ostensibly canon-busting fields as Native American literary studies. In the context of a course on 21st Century Native American Literature, this was a critical lesson. Our class started with novels by Sherman Alexie and Louise Erdrich, who have published with major houses; moved on to Craig Womack’s beautiful novel, Drowning in Fire, published by a university press; then to a poetry chapbook by Mihku Paul—part of the “Native New England Authors” series at Bowman Books, a Native publishing venture run by Joseph Bruchac and his son Jesse; and finally to a self-published memoir by Wampanoag elder Joan Tavares Avant. 27 I wanted students to think about the politics of Native publishing, to engage with the concerns articulated by Elizabeth Cook-Lynn and others over non-Native aesthetic assumptions and mainstream publishing demands. These writers have found that the indigenous texts that garner the most critical and commercial success are those that most closely mimic Western literary aesthetics; tribal authors who express tribally-specific values in tribally-specific forms are often dismissed as “too political” or “too hard to follow.” 28 At the end of our Alexie-to-Avant trajectory, most students were fully prepared to appreciate lesser-known Native writers from New England. But the argument made by Vizjim—that “numbers matter,” and that tribal sovereignty is a reality worth respecting—is still just beginning to be heard on Wikipedia. ¶ 24 Leave a comment on paragraph 24 0 About the author: Siobhan Senier is Associate Professor of English at the University of New Hampshire, and editor of Dawnland Voices: Writing from Indigenous New England (University of Nebraska Press, 2014) as well as Writing of Indigenous New England. She can be found on Twitter @ssenier, and in the blogosphere at http://indiginewenglandlit.wordpress.com/author/ssenier/. I very much enjoyed reading your essay. I have no criticisms. I am intrigued by your title, on both sides of the colon. I wonder specifically about “student accountability.” What would make students accountable to Native authors? Is it that student-researchers and writers, as part of their coursework and authorship of Wikipedia articles, must play a role in expanding the Wikipedia canon? Do you, in other words, see them as having literary, social, and political responsibilities to expand Wikipedia’s coverage? If so, is this kind of informed and informative citizenship limited to the classroom, or is there a larger ethic at work that has implications beyond. For instance, one might ask if people who witness a human atrocity without acting on behalf of its victims are in theory accountable. Do you, in this way, see your students as accountable to Native American authors, Americans in general, the world, etc. if they fail to participate in the movement of these various authors from margins to center, or, better put, from their localities to the mainstream? ((Nodding vigorously)) to Alisea’s questions. Can you tell us more about accountability in the essay text? I only see a version of it (“accountable” once, in paragraph 10, and I can’t tell how you define it. I’m also curious whether it’s a characteristic the students bring with them, or whether it’s something you think they learn through this process. I want to echo the comments above…such a wonderful essay and a contribution that makes a forceful case for web writing. I learned a lot myself from reading it, not only about Wikipedia and web writing itself, but also about Native American authors. This is a terrific and helpful article. I will be assigning it in my spring 2014 Digital History graduate seminar. I can’t think of anything else that I have read that really so effectively takes on Wikipedia’s “notability” standard–to which I had not given much thought before. Alisea’s questions are very thought-provoking and helpful. By “accountability,” yes, I mean that students and everyone who uses or reads Wikipedia has a responsibility to improve it; and also that all citizens have a responsibility to “indigenize space”–to make indigenous and anti-colonial concerns visible and central. At this year’s Critical Ethnic Studies conference in Chicago I heard Seneca scholar Mishuana Goeman make this point very powerfully: that one need not necessarily be indigenous to “indigenize space,” but that everyone implicated in a colonial system needs to take responsibility for putting anti-colonialism front and center. For me, “accountability” therefore means more than just “representing” indigenous people and cultural production, and it means more than “engaging” Native community members–it means actively consulting with them. My students were not just adding “fan” entries to Wikipedia, but consulting with the authors and other community members continually as they wrote. This doesn’t mean (as the last comment, above, clearly illustrates) that Native people always agree on everything. But just as we writers get to consult with readers in this CommentPress platform, so too did my students consult with Native people during their writing, trying, as best they could, to be accountable to those voices. Just to concur – an excellent piece with some good suggestions for improvements from other commenters! Before reading this essay, I was one of the Wikipedia naysayers. As mentioned in one of the comments below, I had had a poor experience with Wikipedia and regarded it as a horrible source. However, I can see several interesting writing and verification assignments that could arise from Wikipedia for my students. I teach journalism, and thus, my students have to understand how to verify information. Most of their stories involve interviewing people and digging out documents at city hall or the courthouse. This could be useful to show them the rigors of verification. Interesting. I’ll have to marinate this idea a bit. This is a very well-written and carefully on an important topic and I don’t think it needs many changes. My comments is somewhat general and may not be of much use. But I think the tone of the piece is a little bit more positive toward Wikipedia than is justified from my experience. For example, in para 3 you quote the “five pillars,” of which the most interesting is number 5, which quite a few commentators have noted is rarely followed (can it even be followed? )–Nate Tkacz especially. It becomes a feint or excuse to impose some extremely rigid and at times arbitrary rules of power that in many ways contradict some basic assumptions about how the site works. In a related vein, I don’t think you dwell as long as I would on how very racist and sexist the Wikipedia community is. A couple commentators here say you make Wikipedia more compelling or attractive to academics, which in one way I support, but in another way I am a little concerned by the overall impression that Wikipedia is a good place to do work on indigenous peoples. It is–and yet I’m not so sure. Part of that is a temporal dimension that you don’t quite mention. What most concerns me about projects like yours is that over time, they are likely to be deleted in their entirety, due precisely to the racism and rigid anti-rule organization of the project. The hostile, often white male editors who can for whatever reason devote a huge amount of time to the site, taking particular areas under their wings as “their” domain, simply wait out the interventions of people whose politics they don’t like. Then, once we (inevitably) disengage, they delete all the pages they don’t like due to “notability” criteria or lack of sources or whatever. I’d like to see the material in this paper revisited in 2 or 3 years to see how much of what is done remains–I’d be pleased, but surprised, if most of it persists. That gives the piece a bit of “here’s what finally happened” quality that I think gives Wikipedia too much credit. There is never any “final,” and very often, over time, efforts to fight the deeply conservative bias of much of Wikipedia get overcome attrition. I’ll be happy to be wrong, and in some cases I certainly am wrong, and maybe things are changing, but I remain very concerned about the problem I describe. Your essay, “Indigenizing Wikipedia,” has been accepted (with revisions) for the final draft of this volume. Several readers raised insightful questions that we encourage you to address in your revisions, such as Alisea Williams McLeod’s comment about accountability and your response about engagement. Adrianne Wadewitz recommended that you mention how Wikipedians have worked to reduce gender bias before many academics recognized this issue. Several readers greatly appreciated how you shared your teaching steps (if you have more, please add or link to them), and your response to Jason Mittell’s query about the ethics of consulting living subjects should be incorporated into the final draft. See also comments raised in the close reading of your draft by Amanda Seligman and Kate Singer, which would be ideal to address if space permits. The current draft word count is 3783 (as measured by WordPress), and the final version should not exceed 3800, so think carefully about making cuts as well as additions. The deadline for submitting your final draft is Thursday May 15th, though sooner is always better. This is a firm deadline, and if you do not meet it, we cannot guarantee that your essay will advance to the final volume. In the next few days, we will post further instructions on how to resubmit and edit your text in our PressBooks/WordPress platform. I really like the emphasis on being a facilitator rather than gatekeeper. This should be a running theme throughout the entire book in my opinion. Yes, excellent – as it happens I just told a student about it because it’s likely to be vry useful for a project she’s working on in a gender studies course, looking at how library categories and curation work (and don’t work) and how those issues persist in digital spaces. 1. In sentence 2, I’m confused about the word “author”–that means the Native American author, not the student author, right? This implies that somehow you got the Native American authors involved in your class. 2. In sentence 4, I think you want “fleshed” out not “flushed” out. Thanks Amanda! I did mean “Native authors,” so will clarify that. And I did actually mean “flush out,” in the sense that we drove some of Wikipedia’s subtler problems out into the open. I am glad to see this list. For years, I have railed against the usage of Wikipedia in my own classroom and in the classrooms of my middle-school age son. I was under the incorrect impression that it was a you-post-it and it’s-there-for-the-world-to-see deal without any level of oversight. One of my former bosses posted his bio on the site and was quite proud of his accomplishment. I think that’s what left such a sour taste in my mouth about Wikipedia. He was not an important figure in American history. Thankfully, Wikipedia did take the posting down. Most of the imbalances in Wikipedia are quite predictable. Your example of Bieber vs. Wilma Mankiller is hardly bizarre. The majority of people who have free time to edit Wikipedia (young people in the US) are more interested in Bieber than Wilma Mankiller. Understanding the editor demographics helps you understand what is on Wikipedia. 90% of Wikipedia’s editors are male, for example. That shapes the encyclopedia. A better word than “bizarre” here might be “troubling”, and a discussion of the demographics of Wikipedia editors would definitely help contextualize the issue. In a comment on the last paragraph of this essay, I ask about the distinction between notability and significance. This paragraph is one place to weave in that idea. Notability is much more about celebrity, and significance about long-term importance. Sadly, I don’t think it’s accurate that irrelevant/inappropriate content is inserted only by “high school students”. Put another way, accounting for inappropriate content by saying that it’s done by high school students papers over the wide range of vandals’ backgrounds, possibly helping to further, in a small way, the perception of trolls as essentially harmless teenage boys in their bedrooms. I’m confused by the reference to Justin Bieber’s page being on lockdown. Perhaps sometimes it is, but at the moment it doesn’t seem to be. Can you add the word “sometimes” to the parenthetical? I might suggest elaborating a bit more on what you mean by “blitz” editing. I think your point on Wikipedia embracing its use as a pedagogical tool is interesting. You may want to elaborate on what you see as proper use of the site as a teaching aid. Your first footnote gives reference to the assignments of Professor T. Mills Kelly, but you don’t touch on whether this is a good use of the website or not. I don’t think you should go into an extended discussion of web ethics, but I think the issue is worth mentioning. Thank you for including the link to the School and University Projects page, which I did not know about (despite being cited by name in this paragraph! thanks for that too!). 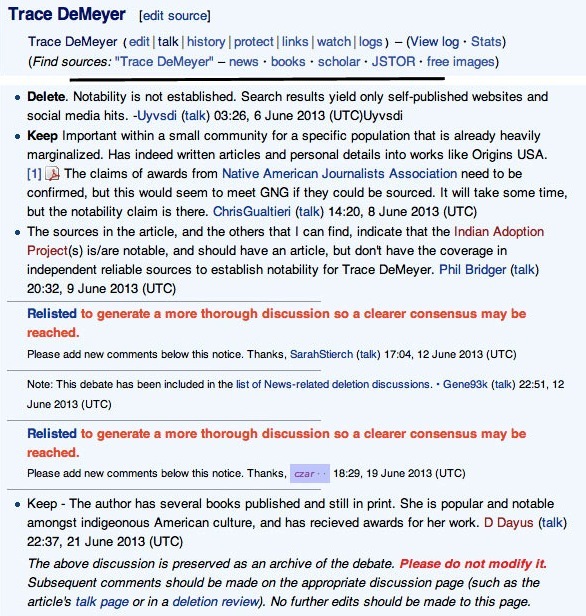 Not only is Wikipedia and other crowd sourced versions of history likely to be male-biased and potentially racist, there is also a problem concerning the authors on Wikipedia, which are predominately white men, and the removal of female American writers from a list of American writers. You might be interested in this link if you’re not familiar with this debate: http://www.nybooks.com/blogs/nyrblog/2013/apr/29/wikipedia-women-problem/. This is a compelling paragraph, especially the last sentence. It is perhaps new within academia to care about systemic bias in Wikipedia, but there have been efforts underway for years on Wikipedia to remedy these problems. Ignoring them and privileging only what professors have done wipes out the history of those of us on Wikipedia have been doing. Academics did not suddenly “discover” the problems on Wikipedia and rush to fix it. Wikipedians have known about them for a long and time and have been working tirelessly to fix them. The gender gap outreach efforts, for example, started with a WikiChix lunch years ago at Wikimania and have had at least 3-4 years of sustained, funded efforts to help improve the gender problems you discuss. Whoopss…I spoke too soon. Please ignore my previous comment on the paragraph above. But I’m so very glad to see this issue addressed in this book! Point taken, Adrianne! Thank you SO much for weighing in! This paragraph about accountability renders the Wikipedia assignment more compelling than I’ve heard argued in the past. The standards also seem to alleviate the instructor’s role as possible grammar police…. Great paragraph, good points, rare academic praise for Wikipedia. I bet the Wikipedia editor comments made the students think more critically about their writing and strive to improve it. Students might be like children. We can tell them something over and over, but once they hear it from an outside source, it sticks. This essay is so interesting and might make this tough recovering reporter rethink Wikipedia. This is very compelling! I wonder how those of us who choose to blog can make this case to our students…in my experience students do not believe that their blog will be read by anyone but themselves. I wonder at times about that as well. However, several times in my classes, students have reported that strangers have commented on their posts. At first, they are a bit creeped out, but then they realize they are reaching an audience somewhere. One of my class blogs (more of a vlog than blog) has had clicks from Russia and Thailand. Also, love the idea that the feedback comes from Wikipedia in 20 minutes. These students are so accustomed to a fast-paced world. I wish I could grade assignments that quickly! As an extension of Holly Oberle’s point, I think that the reactions you garnered as a result of Wikipedia work are very interesting compared to student reactions I have seen to blog projects. I think that today’s students are not accustomed to being a single individual, but are rather used to being a cog in a larger system (something akin to the sharing that occurs on sites like Twitter and Tumblr). There is a lot of literature out there about this very topic, and I wonder what everyone’s thoughts are regarding the community nature of Wikipedia as opposed to the individualized nature of the blog. I think you need one more sentences after the “more profoundly” sentence. The excellent student quotation does not fit well with the first part of the paragraph about timing of response. This is a great paragraph! Successful Wikipedia assignments always have this step-by-step structure! Thanks for showing yours! This is an excellent primer – not just for the students, but for the audience as a whole. Most people wrongly assume editing Wikipedia is a lark – so good job showing just how hard and rigorous it is. I also love this setup but I’m also wondering how one might go about producing content on a deceased author? And was there any difficulty between the student and the authors? Were there any students that were unwilling to participate? I can imagine that writing an article about someone you’ve had contact with might be a very intimidating process! This sequence is great and very helpful. When I revise my essay, I intend to link to it in my discussion of Wikipedia-based assignments. I would suggest moving the parenthetical comment about the Native authors up to the beginning of the paper as an explanation. I’m also eager to know about their responses to the student papers. I wonder if it’s worth reflecting a bit on the ethical issue of consulting with the subject you’re writing about. I know that WP has guidelines to ensure that people are not writing their own biographies (see https://en.wikipedia.org/wiki/Wikipedia:Autobiography ), and the edict against original research might apply to interviewing the subject. Is it worth discussing these issues here? Grin. I was kind of wondering whether someone would raise this issue, Jason. In practice, very few of the Native authors were hands-on or directive; they were, however, HELPFUL in providing pointers to print information that was hard to find, or even public-domain photographs. But yes, people have addressed this issue (e.g., of Wikipedia subjects–even corporations, not just individuals–silently “deputizing” writers to create entries for them), and I can add a few references there. I love the sentence about the deadlines and students that are accustomed to cranking out a paper the night before and accepting a mediocre grade. Perhaps this assignment will show students the value of working ahead. Planning their work and working their plan. Plus, with an outside source that proposes deletion, it gives them that very real world experience that poor planning and execution that might fly in some (not all, please don’t get mad but we know a class or two that is not as rigorous as others) college classes doesn’t fly in the real world. There is a lot going on in this paragraph. I got stuck on the sentence beginning “like many college professors.” I’m not totally sure I understand that. Do you mean both Wikipedia and college professors valorize information published in print sources like newspapers, magazines, and scholarly books and journals over tribal websites? For what ends, I would ask? I would disaggregate this a bit more–college professors value scholarly books and journals over newspapers and magazine articles for certain kinds of activities but not for others. Also, what’s going on in the last sentence (the Rosenzweig quotation) doesn’t fit with the first part of the paragraph. The first part of the paragraph is about meeting a notability standard–if there aren’t traditional publications about the person, then they don’t count (from Wikipedia’s point of view). But the Rosenzweig quotation is about quality, not a count of whether books or articles exist about a person. Good reading, Amanda, thank you very much! I’m a journalism professor. I love this part. I hope that the feedback from Wikipedia spurred them to do better research and writing … that they dug through documents and stacks for research and rose above the “local puff” that was mentioned. Could you show how having Wikipedia articles changed how the internet perceived of the people whose articles you created? I’ve often found that once a Wikipedia article is created the text is copied on many sites – this would show how important the notability criteria is. Its effects are not just internal to Wikipedia. This debate about notability has me wondering whether it spawned any class discussion about distinction, aesthetics, or alternative arguments for canon creation among Native American authors? Did you have students back up, or turn in non-Wikipedia copies of their work to you–so you had it even if deleted online? Wikipedia does keep every single version of every single change; but yes, I strongly encouraged them to draft in Word, and export their essays periodically, etc. . .I talk to them quite a bit about backup, since shockingly few of them seem to do it! It might be good to compare what Wikipedia has about Erdrich and Alexie to the authors you had your students write about, as I know it is a lot more. It would add force to your point in this paragraph. Agreed – just word counts & longevity of the entries would contrast effectively. By the end of this essay, I was looking for you to make a distinction between Wikipedia’s idea of “notability” and the scholarly notion of “significance.” I wonder how these articulate.